Nottinghamshire Wildlife Trust have submitted a Planning Application for proposed work at Skylarks Nature Reserve, which is to integrate the newly-acquired land with the original reserve and to make habitat improvements. The planning application number is 14/00706/FUL and the plans are on Rushcliffe Borough Council’s planning website at www.document1.co.uk/blueprint/ Please take a look at them and feel free to comment if you wish – hopefully in support! We have recieved notification that the application has been passed by the council, so another milestone for the project has been passed and the winter months should see some major engineering works at Blotts Pit as some parts of the site are re landscaped to create wet meadows, ponds and reedbeds. The Wildlife Trusts (the parent body of Nottinghamshire Wildlife Trust and all the other county trusts) launched this national campaign on Thursday April 3rd. The existence of grasslands is generally taken for granted BUT they are surprisingly diverse wildlife habitats AND information collected by the Wildlife Trusts indicates that they are in “catastrophic decline”. 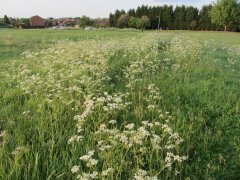 Please see the Grasslands campaign pages on the Wildlife Trusts’ website and sign their e-petition to support getting this issue raised with the government! Plants – annuals, summer bedding, perennials, etc. Any offers of goods and/or assistance with running the Fair to Gordon Dyne (0115 878 4842 or gordon.dyne@gmail.com)!